The shoulder is the most often moved joint in the human body. Shoulder pain symptoms are usual in practically every age group and shoulder pain causes may vary. The shoulder joint consists of a ball of the humerus or the upper arm bone and a socket in the clavicle or the shoulder blade. The socket part is shallow, and only a small part of the ball is in contact with it at any time. This allows the arm to move freely in many directions, but the joint is not very stable and demands good and coordinated action of the muscles to function. Along with it also other joints close by take part in the functioning of the shoulder girdle. Adequate functioning of all these components along with muscles and tendons attached to them is necessary for good and painless movements of the upper extremities. The group of muscles and their tendons responsible for the stabilization and the movements of the shoulder are called rotator cuff. The problematic part of this structure is located in the space between the head of the humerus and overlying part of the shoulder blade called acromion and ligaments attached to it. Gravity causes stress for the tendons of the hanging arm and movements to the side and forwards give friction between the head of the humerus and the roof of its space, the acromioclavicular ligament. Between rotator cuff and acromion, there is a fluid-filled sac, called bursa, lined with synovial membranes. It permits easy gliding between bone, muscle, and tendon. It can sometimes become irritated and inflamed, causing shoulder pain. This problem is called shoulder bursitis. The disease can start with considerable pain in the shoulder. Lifting the arm to the side is usually limited due to pain, even if it succeeds with assistance. There may be a swelling in front or on the outside of the shoulder and tenderness can be severe. Bursitis can be most painful at night. This is explained due to the fact that during the day, in a standing position, gravity pulls down the upper extremity and this way takes away pressure from the bursa. At night, it is pressed again when lying down and this may cause irritation and discomfort. At night, one may try to put the painful hand between ones legs and try to get a little traction to the shoulder by small extension of the spine. Degeneration of the rotator cuff starts a long time before any pain in the shoulder is felt. In their fifties people often already have thinning of the tendons, later on some tears in them are not an unusual sight. With aging the posture of the shoulders often becomes more or less slumped forwards. In this case the rotator cuff is more easily compressed when the arm is lifted forwards or to the side and this can accelerate degeneration. Tendons also get more easily torn. Severity of the shoulder problems varies from mild inflammation or strain of the muscles healing without any treatment in a few days to total tear of the rotator cuff tendons requiring surgical repair. Most of the shoulder pain is caused by problems of the tendons. Most often reason may be degenerative or calcific tendinitis. Also bursitis gives very similar clinical symptoms. The movement to lift the hand to the side requires accurate balancing and synchronization of all participants and even a small disturbance of activity of the muscles, directions or range of the joint movements may upset the smoothness of the motion and strain or irritation of the tendons may follow. Also outside stress may give this same problem. Problems may arise when there is excessive strain on a normal joint, normal strain on an uncommon joint or normal strain on a normal joint if the joint is not ready and prepared for this activity. Tendinitis usually begins close to the area where the tendons attach to the bone. The blood supply and the circulation here are poor, and even a small irritation or a trauma may take a long time to heal. This can cause secondary irritation and some tendon fibers may die. The repetitive daily use and misuse gives pressure to the tendons, and they may swell or calcify. In the beginning this may be without any pain or any other symptoms. This increases the pressure on the rotator cuff and causes more strain and a vicious circle may follow. Along with the tendons also bursa may get irritated, and inflammation of the bursa- bursitis may take part in the process. Rest or treatment may stop the process, and the inflammation may resolve. If the process continues the tendon may get thicker due to additional degeneration or minor traumas, more calcium may get deposited, and bursa may get thicker. This will make the situation worse because whatever is the cause giving more pressure to the tendon, this will always worsen the circulation of the tendon and the vicious circle continues. Pain is the initial symptom of the rotator cuff tendinitis. It can be felt as a deep ache in the shoulder area also on the outside the upper arm. It may be worse during the night. There usually are tender points over the irritated area. Pain often increases gradually and becomes worse when lifting the arm to the side. Pain may be associated with a limitation of the shoulder movements. Especially movement to the side is limited. Reaching above the shoulder level may be impossible and, for example, playing tennis, swimming, painting the roof or getting things from the upper shelves must be left undone. Even a fully functional rotator cuff may tear in an accident. The weaker the rotator cuff is and the greater the power focused on the joint, the easier it gets injured. When rotator cuff is weakened by degenerative changes, even a minor trauma or a stress may easily cause a partial or a total rupture of the tendons. The area where this happens is usually just below the acromion between it and the head of the humerus in the anterior portion of the cuff. The trauma is often not significant. It may happen during some manual work, sports or some other overhead activity. Sometimes no specific history of tear or stress can be found. Symptoms usually consist of sudden, severe tearing type of pain followed by a period free of pains. In typical cases pain then gradually returns lasting for some days or weeks. Typically, the tearing is partial. This causes pain in the shoulder as the hand is horizontally lifted upwards on the side. In typical cases, the pain is worse if the hand is lifted with the palm facing up. Often when lifting the hand up in the front, the last part of lifting is painful. If lifting the hand up on the side is impossible and if it drops down when lifted there by someone else, the tear may by complete. Surgery may be necessary here. Examination shows soreness on the outside the shoulder below the bony structures. During testing the level of joint irritation, the hand is lifted directly up on the side and twisted outwards with the elbow bent. Resisting this movement often recreates the pain. The same type of symptoms can be evident when there is rotator cuff tendinitis or the mucous bursa gets inflamed. It is hard to distinguish between these conditions based on a doctor’s examination only, and it often is not even necessary, because the treatment is much the same. Sometimes the calcium contained in the rotator cuff bursts out and causes extremely strong pain. In this case, a calcification that was clear in earlier x-rays may disappear or blur in a x-ray. As treatment, cortisone shots and pain medication of adequate strength may be tried. The most important thing in shoulder injuries is a careful interview and examination. If necessary, the bones can be imaged with a x-ray. Often this does not help with the diagnosis, because changes in the bones rarely cause these symptoms. An ultrasound examination may give additional information. It can show the inflamed mucous bursa, torn or inflamed tendons, and movement out of place in the long end of the biceps. Sometimes a contrast medium examination of the joint -arthrography is necessary to locate the frozen shoulder joint and the tears in the rotator cuff. The best way to diagnose most shoulder problems is the MRI. Cortisone injections are helpful in shoulder pain treatment and may end the pain quickly. It is important to recognize the structure that is causing pain, so that the injection can be directed in the right place. This works best if the shot is given with the help of an ultrasound. Most difficult cases may warrant surgery. The surgery is an attempt to repair the torn tendons, make more room for the rotator cuff and attach the end of biceps that does not stay in its place. People undergoing surgery have a good possibility of recovery. Certainly results depend on the size of the injury. Self-treatment to alleviate the pain consists of over-the-counter anti-inflammatory medication that can be used for a few days. Over-the-counter ointments may be rubbed in the shoulder area. Rest and cold compresses with ice 15-20 minutes at a time several times a day will calm the irritation. Sometime a sling may help to keep the shoulder at rest. A couple days’ rest is beneficial at the time of acute pain. The shoulder should be moved slightly and will stiffen if it is not moved at all. During acute pain, it is advisable not to carry anything with the sore hand, and to avoid exertion. Raising the hand on the side horizontally and at night, sleeping on the sore shoulder should be avoided. In the beginning shoulder pain at night or during sleep may be severe. In the night the painful rotator cuff is pressed against the bony structures with additional force as the gravity does not pull the hand down. At the most painful time, the hand can be hanged over the side of the bed, or while leaning forward on a table. The arm can be circled while in this position with the help of gravity. If this stretch feels good, you can hold an additional light weight in your hand. Shoulder exercises should start gradually and with care. The range of motion of the shoulder can be maintained by lifting the sore arm with the healthy arm. Do not lift to the side if this causes pain. You can also walk your fingers up a wall. In general, movement is beneficial, so long-term rest is only prescribed in cases of fractures. If a shoulder movement is painful, however, avoid doing that particular movement. When the pain subsides exercise can be started. Lifting the upper arms at the front is usually safe. Do not lift to the side until the shoulder feels better. While typing, it is advisable to hold the elbows close to the body. The higher the upper arms are, the more the rotator cuff is being irritated. In case of the shoulder joint problems there may be a residual sensitivity to stress, which cannot be treated. The stress directed at the shoulder joints should be kept low. Weight lifting or gym may be tried by starting slowly and increasing stress endurance. The acromioclavicular joint, located between the collar bone or the clavicle and the shoulder blade or the scapula, may be one cause of pain in the shoulder girdle. The reason may be inflammation due to rheumatic or degenerative arthritis. Many types of traumas in this area can also cause pain due to a tear of the intra-articular meniscus, a contusion, tears of the ligaments with or without separation of the bones and a fracture of the collar bone. If the tear of the ligaments around this joint is complete, the end of the clavicle will rise. This is easy to notice in comparison with the other shoulder. The pain of this joint can be provoked when the arm is lifted over to the opposite shoulder. When lifting the hand up on the side, the pain is felt only above the horizontal level—that is, higher than in cases of rotator cuff problems. If this joint is the problem, it usually also will feel sore on examination. Generally the functioning of the shoulder remains satisfactory, so treatment is not always necessary. In the acute phase over-the-counter pain medication can be used for a few days. Rest and cold compresses may also be useful. During acute pain, it is advisable to avoid heavier strains. If the problem disturbs the functioning of the shoulder for a longer time, surgery may be considered. Tendons of the biceps muscle go through the same age and wear related changes as does the rotator cuff. Calcification is not so common, but ruptures arise as easily. Sometimes the long end of the biceps gets inflamed or does not stay in its place. Pain is then felt in front of the shoulder, and it increases when the elbow is bent against resistance. When the tendon slides out of its groove, a popping sound may be heard repeatedly. The long end of the biceps may also tear. This is relatively common in the elderly. Usually some pain and limitation of the movements of the shoulder due to degenerative changes precede the tear for a long time. The tear typically gives a snapping sound in the shoulder with some pain, and after this, the formation of the so-called Popeye muscle or a clear bulge in the biceps as it contracts can be seen. This may look quite dramatic but usually does not require surgery, because operation does not markedly improve function and the other shoulder muscles can adequately compensate the work of the torn muscle. Usually doctor’s examination is enough for the diagnosis, sometimes imaging with ultrasound or MRI may be used for the confirmation. 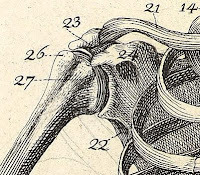 The frozen shoulder or adhesive capsulitis of the shoulder joint is a strange problem. The shoulder joint capsule starts diminishing, and the shoulder gets very sore and then starts to stiffen. The problem is one of long duration and it can last from months to a year or longer. Especially if the patient has diabetes the duration may be prolonged. In about 15 % of patients, the pain appears in one shoulder first, and when that subsides, appears in the other one. The exact cause of this illness is unknown, but sometimes a trauma probably can be blamed. It is a common belief that there may be an autoimmune component attacking for some reason the capsule and it thickens and becomes tight. The amount of synovial fluid in the joint decreases and the lubrication suffers making movements harder. Risk factors can be diabetes, stroke, rheumatic disorders and difficult lung and heart diseases. The condition develops in three stages. It usually begins with no obviously triggering factor. In the beginning, the joint is very painful, and after some time movements become gradually more and more limited, the joint is said to be freezing. Pain is often worse at night and in cold weather. Pain is almost constant, and even small sudden movements can be very painful. In this stage examination shows an extremely painful shoulder. Diagnosing the problem may be difficult, because the symptoms resemble those of the rotator cuff tendinitis or rupture as long as the typical limitation of the movements has not developed. When the stiffness begins, rotating the shoulder outward is usually the first restricted function. As the pain worsens, the range of motion gets smaller and smaller. This phase may last from some weeks to several months. In the second stage pain usually decreases, but the stiffness remains. If the restriction is severe, even small daily tasks may be hard or impossible to perform. This frozen stage usually lasts months. In the third stage the motion slowly improves. In most cases, the shoulder gets better without any residual complications, but this may take a long time, sometimes up to 2-3 years. The correct diagnosis should be made quickly due to the long-term nature of this illness. The diagnostic tool is contrast medium examination, if the clinical picture alone cannot confirm the diagnosis in doctor’s examination. If stiffness prohibits functioning, improving the range of motion with manipulation under anesthesia may be considered. Results are somewhat controversial. After this procedure, it is important to maintain the range of motion with the help of active shoulder exercises performed with a physiotherapist. Physical therapy, exception for cold compresses, should be avoided because it may worsen the pain. When the stiffness in the shoulder subsides, treatment to restore range of motion may be appropriate. It is important in all stages to keep the range of motion as wide as possible within the possible limits. Usually it is, however, not possible to influence on the course of the disease or in the time needed for the recovery. One reasons of pain in the shoulder may be arthritis. Osteoarthritis or degenerative joint disease is the most common form but also rheumatoid arthritis is possible. Shoulder is, however, not usually the first joint affected in the rheumatic diseases. In osteoarthritis the cartilage in the joint degenerates or wears down. As the disease progresses, the cartilage wears thin and it may expose open bone. Osteoarthritis typically affects older patients often with some previous trauma in this area such as a fractured or dislocated shoulder. Osteoarthritis is considered to run in families. Symptoms of arthritis typically start with pain in physical activities or when moving the shoulder; there may also be occasionally some swelling of the joint. There may be pain also after the stress or even at night. It is usual to have some stiffness in the movements, additional sounds and later also limited range of motion. Typical history, examination and x-rays of the shoulder joint are usually sufficient to establish the diagnosis. Sometimes additional tests and imaging are needed to exclude other problems. Self treatment includes taking over-the-counter anti-inflammatory drugs to minimize inflammation and pain. In the acute phase cold compressions may help, later warm treatments may be more useful. Physical activity with the affected extremity should be narrowed down to the suitable level. In an acute situation some days of rest may be needed. However, one should perform exercises keeping range-of-motion open and not let the shoulder stiffen. If this is hard without an instructor, physiotherapist is able to help. If this is not sufficient, doctors can prescribe stronger medications, and also injections of corticosteroids are used. If this does not give enough relief, there are also surgical treatments available. These include total or partial shoulder joint replacement surgery or arthroplasty. Removal of a small part of the end of the collarbone is used as treatment of arthritis of the joint between the collar bone and the acromion part of the shoulder blade or the acromioclavicular joint. The shoulder joint is not very stable, and it may be easily dislocated as the anatomy is conducive to that and the soft tissues around the joint are flexible. A shoulder injury can cause the dislocation of the joint in anyone. If it is dislocated the shoulder usually moves into an abnormal position and the normal round shape of the shoulder becomes angular. Moving the arm is limited and painful. A doctor´s examination and a x-ray if needed can confirm the diagnosis. One can try setting the shoulder back in its place by lying on a bed on one’s stomach and letting the arm to hang freely on the side of the bed while relaxing the shoulder. Often the shoulder is set back in its normal position this way. If not, then a doctor can help snap the shoulder back into its right place. The side of the shoulder blade or the scapula by the middle line may rise if the serratus anterior muscle that attaches it to the sternum is paralyzed. This may occur if the long thoracic nerve in its course for instance over the collar bone gets injured due to an operation, pressure, injury, or inflammation. Risk factors are vigorous athletic maneuvers with the upper extremity, lifting of heavy weights, and direct outside pressure. The normal function of the serratus anterior muscle is to maintain the scapula and the thorax next to each other when the arm is elevated forward at the shoulder. The symptoms usually include pain and weakness of the shoulder. Doing push-ups, leaning the arms against a wall or lifting the arm up at the front with resistance may cause the inside edge of the scapula to rise in comparison to the other side. Humans are generally slightly asymmetrical, so little differences should not matter that much. Diagnosis may be confirmed with the help of nerve conduction studies and EMG. Treatment usually consists of a follow-up. Taking B –vitamins may optimize situation for nerve healing. If the functional situation is bad, a splint that presses the scapula against the chest may be considered. The problem usually improves from the worst stage and gets better within approximately nine months. Weakness of the arm and mild pain may be present permanently. Here, work-related stress should be adjusted to the level of the functional state after the injury. Sometimes also surgical procedure of the nerve may be used if optimal functioning of the upper extremity is vital as for instance with the top level athletes. Sometimes moving the scapula causes a cracking sound. This may be caused by a raised bone or an inflammation of the mucous bursa that causes roughness when the scapula moves along the chest. This symptom usually does not require treatment. Rarely,, surgery may be considered. Pains in the shoulder may originate somewhere else. The most common cause for this is a degenerated cervical spine, and its pains can radiate toward the shoulder. Gall bladder pains may radiate to the right shoulder and heart problems or heart attack to the left shoulder. In these cases, examination and treatment naturally have to be focused on the underlying conditions. Extremely strong pains in the shoulder. Prolonged pain in the shoulder that limits working or life in general. A marked limitation in the range of motion of the shoulder. webMD about anatomy of the shoulder. Eorthopod.com pages about anatomy of the shoulder. Mayoclinic.com on rotator cuff injuries. American Academy of Orthopedic Surgeons on rotator cuff tears. HealthDesk.com about axillary nerve dysfunction. Ehealthmd.com article about rotator cuff surgery. Eorthopod.com article about acromioclavicular separation. American Academy of Orthopedic Surgeons about biceps injuries. American Academy of Orthopedic Surgeons about shoulder joint tears. American Academy of Orthopedic Surgeons on frozen shoulder. American Academy of Orthopedic Surgeons on arthritis of the shoulder. webMD exercises for building shoulder and back muscles. SwimSmooth.com on how to avoid swimming shoulder injuries. Fill out Shoulder Pain Symptoms/Complaints Form! This helped me self-diagnose my shoulder pain, which mainly happens when I reach out and back with my arm, rotating the humerous. I think I have been re-injuring the cuff and not realizing it. This makes it seem like frozen shoulder, but I think its the terres minor muscle where it attaches to the shoulder. The pain has been a hassle for about 2 months now, but getting better. Ice and ibuprofin and easy range of motion excersizes have been helpful. One huge reason is a lot of typing for doing programming which also includes moving the right arm back and forth for mouse clicks. When I became aware of this and now keep my arms closer to my body with the mouse even with the keyboard(in height), its getting better quicker. I'm pretty sure the trauma started with throwing a foot ball long distances with my grandson. I am 55 yrs old and had not thrown a football for quite a while, should have started easy, then built up. I had been doing less physical activity since starting programming full time. Throwing is one of the most common reasons for shoulder tendon problems. When the hand is in the up position, the tendons are being squeezed, and a sudden movement can cause the tear easily. Range of motion may be limited for several reasons. However if the external rotation of the hand, or rotation away from the center of the body, is free, usually the reason is not the actual frozen shoulder. In most of these cases the pain and the restriction of movement is caused by a tendon rupture or inflammation. You seem to understand the anatomy of the shoulder, and this provides an excellent basis for the future. In the long term shoulder tendon problems do not necessarily much limit physical activity. Of course it is good to start gradually and to slowly increase the level of intensity. A good programmer needs some physical exercise; also the brain works better then. the awesome works guys I've incorporated you guys to my blogroll. Exercise is very useful to stay fit & fine.Exercise give us refreshment & work whole day with fresh mind.Do exercise daily stay the doctor away. The shoulder is the most mobile joint in the human body. A group of four tendons in the shoulder, called the rotator cuff, give the shoulder a wide range of motion. Swelling, damage, or bone changes around the rotator cuff can cause shoulder pain. You may have pain when lifting the arm above your head or moving it forward or behind your back. The most common cause of shoulder pain occurs when rotator cuff tendons become trapped under the bony area in the shoulder. The tendons become inflamed or damaged. This condition is called rotator cuff tendinitis. Exercise can bring some kind of relief, only in worse condition doctors recommend to get surgery. Here in beverly hills there are many best orthopedic and hemiarthroplasty surgeon, if someone dealing with sever condition of shoulder pain then they can consult orthopedic surgeon in Beverly Hills - Dr. Sonu Ahluwalia, a leading expert in sports medicine and orthopedic surgery. Consult the best to get best.